Epic's Rod Fergusson is part of the deal, and now works for Black Tusk. 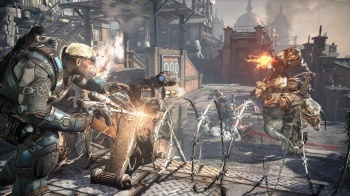 "Today we're excited to announce that Microsoft Studios has acquired the rights to the Gears of War franchise from Epic Games," says Microsoft, "including rights to all existing and future games, entertainment experiences and merchandise." Vancouver studio Black Tusk will take over development, and Epic Games' Rod Fergusson has been installed at Black Tusk in what Microsoft describes as "a key studio leadership role." Epic still has a good relationship with Microsoft Studios, claims Black Tusk's Hanno Lemke. Black Tusk intends to collaborate closely with Epic to ensure its Unreal Engine tech works smoothly in future Gears installments. So far Fergusson's the only one to jump ship, but Lemke's confident that, once other developers with a passion for Gears hear the good word, they'll want to come to work for Black Tusk too. "I've been privileged to work on a lot of great games with a lot of great teams," says Fergusson, "but Gears has had the most impact on me professionally and personally, so this really feels like a homecoming. "I can't wait to share more with you all soon."